A teacher's attitude, behavior, language and teaching style can do a lot to make or break a good student. Best teachers encourage learning, effort, motivation and curiosity .There is a famous sentence that says " we teach what we are" so we have to nurture a positive atitude towards our students results since the very first classes. Praising is the best way to get this.The best teachers know that one of the essential elements in encouraging a student to do better is praise. Students, just like all other human beings regardless of age, like to be praised. Publicly praising a student also has the added benefit of encouraging other students to strive. However, if you think that it might have the opposite effect of alienating some students, you can try private praise by calling a student after class and praising him/her for a job well done. Thinking of that, I share with you below some sentences that you should incorporate to your classroom language so that you can make sure you are praising your students and avoind so many repetitive Very Good! 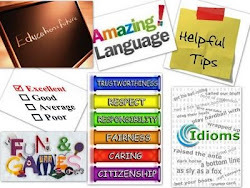 For every achievement, effort, good attitude, your students deserve one praise.Try these ones! Some Ways To Say "Very Good!" You’re doing that much better. I’ve never seen anyone do it better! You’ve got your brain in gear today! That’s coming along very nicely!